We study the impact of precision timing detection systems on the LHC experiments’ long-lived particle search program during the HL-LHC era. We develop algorithms that allow us to reconstruct the mass of such charged particles and perform particle identification using the time-of-flight measurement. We investigate the reach for benchmark scenarios as a function of the timing resolution, and find sensitivity improvement of up to a factor of ten over searches that use ionization energy loss information, depending on the particle’s mass. CMS collaboration, Technical proposal for a MIP timing detector in the CMS experiment phase 2 upgrade, CERN-LHCC-2017-027. ATLAS collaboration, A High-Granularity Timing Detector (HGTD) in ATLAS: Performance at the HL-LHC, ATL-LARG-PROC-2018-003. M. Fairbairn, A.C. Kraan, D.A. Milstead, T. Sjöstrand, P.Z. Skands and T. Sloan, Stable massive particles at colliders, Phys. Rept. 438 (2007) 1 [hep-ph/0611040] [INSPIRE]. CMS collaboration, Search for heavy stable charged particles with 12.9 fb −1 of 2016 data, CMS-PAS-EXO-16-036. DELPHES 3 collaboration, DELPHES 3, A modular framework for fast simulation of a generic collider experiment, JHEP 02 (2014) 057 [arXiv:1307.6346] [INSPIRE]. 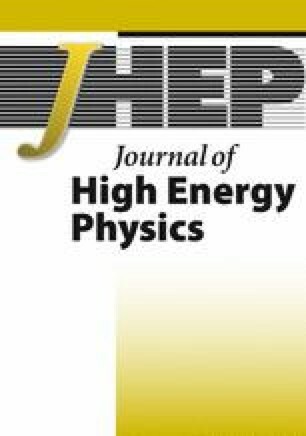 G. Apollinari, O. Brüning, T. Nakamoto and L. Rossi, High Luminosity Large Hadron Collider HL-LHC, CERN Yellow Report (2015) 1 [arXiv:1705.08830] [INSPIRE]. S. Mersi, D. Abbaneo, N. De Maio and G. Hall, Software package for the characterization of Tracker layouts, in Proceedings, 13th ICATPP Conference on Astroparticle, Particle, Space Physics and Detectors for Physics Applications (ICATPP 2011), Como, Italy, October 3–7, 2011, pp. 1015-1024 (2012) [INSPIRE]. E. Chabanat and N. Estre, Deterministic annealing for vertex finding at CMS, in Proceedings of 14th International Conference on Computing in High-Energy and Nuclear Physics (CHEP 2004), Interlaken, Switzerland, pp. 287–290 (2004) [INSPIRE]. D. Contardo, M. Klute, J. Mans, L. Silvestris and J. Butler, Technical Proposal for the Phase-II Upgrade of the CMS Detector, CERN-LHCC-2015-010. J. Liu, Z. Liu and L.-T. Wang, Long-lived particles at the LHC: catching them in time, arXiv:1805.05957 [INSPIRE].